For a very small landlocked country getting around Nepal for a tourist is often a slow frustrating experience. Tourist buses will take you to all the main tourist destinations in the country. But after that it's a mix of local buses, taxis, motorbikes and the odd rickshaw. Nepal's roads are generally in quite poor condition and effected by the seasons e.g. monsoon. When there's repair work being done it usually means delays of several hours. Mix in Nepalese strikes (bandas) and the delays can really hamper a journey if you are not careful. Plan ahead though and you'll be just fine. Do take note of the following though as it will help you with your trip. There are several types of bus in Nepal and they nearly all suffer from years of bad road conditions. Flat tires are quite common as are breakdowns. But the good news is that such delays are usually fixed quite quickly and on the spot. The second biggest delay in local bus transport comes from the frequent stops to let people off or pick them up. Tea breaks and meal stops play a role here too. Tourist buses generally have fewer stops. Bus parks are centrally located with in all the big towns and most local transports know where to find them. However once at the bus parks don't expect to see destinations listed out or set time frames. Asking around is the best option to find the bus you are looking for is - people will be quite helpful in point them out. Buses generally only leave when they are full. Private tourist buses may have their own pick up points. i.e. Greenline. These come in two forms. New express "high-end" tourist buses and the more common "tourist" bus. Premium buses: High-end buses are generally only available between Kathmandu and Pokhara. Though routes to Chitwan open up during peak season. These buses generally have their own stops. Your luggage is generally stored inside compartments but also on the roof if there's not enough room. Ticket prices are often $25 or more but include lunch. Popular services include Greenline, Mountain Overland and Jagadamba though the latter charges "forigners" more. Regular tourist buses: These are older express buses that often don't have working air-conditioning. These are the most common forms of intercity transport for both tourists and locals alike. These buses stop for lunch and sometimes a tea break. Your luggage is generally hoisted up on to the roof and strapped down. There's no charge for this and it's generally covered if raining. They usually leave from set bus parks at half the price of Express buses. For all kinds of bus transport it's best to carry your valuables with you rather than leave them with your main luggage on the roof or out of sight. Do read my guide on the Kathmandu to Pokhara bus route. Night buses: These are the same as "tourist buses" but generally only leave every easy in the morning or late at night and get in very early in the morning. They don't always run and are generally not for the faint of heart. Micro-vans: These are usually little Toyota vans that have been converted to allow for more seats. Usually by removing seat padding and putting in benches. They are cramped and not very comfortable. They are used extensively as bus transport within cities and depending on the distance usually cost under 10 rupees. There are some newer micro vans that are used for long distance transport in replacement of tourist buses. They are generally faster, more expensive and not as cramped as the inner city micro vans. Nepal's taxi ranks are mainly made up of little white Suzuki's. They are meant to be metered but the reality is the meters don't work. The taxi's are small but provide for an essential transport service in Nepal. Always agree on a price before getting into a Nepalese taxi. Many a driver will try to take your luggage and put it into their boot and just say "no problem" or "yes, yes". Always agree on a price before getting in! Taxis off a fast cheap way to get around cities and many tourists often hire taxis out for a day of sight seeing. Nepal has quite an extensive domestic airline industry. Domestic flights arrive/depart from the the terminal adjacent to Kathmandu Airport. Tickets are bought from many of the travel agents you will see in the cities or indeed from your hotel. You can generally find a seat the day before you leave with no issues. Flights do have a habit of being cancelled or delayed due to weather conditions or repair work. As such if your international flight is leaving on a fixed day from Katmandu always try to be back in Kathmandu at least a day early ... just in case. Four wheel drive vehicles are used extensively in Nepal both by locals and tourists. For tourists they are used mainly for reaching some trekking start points or on overland journeys from/to India and from/to Tibet. It's also possible to hire a jeep out for sightseeing as they are more comfortable than private cars. However the price does go up as well. More about traveling overland from Nepal into Tibet. And, more about traveling overland from India into Nepal. Renting a motorbike in Nepal: Motorbikes are everywhere in Nepal. From speeding students to a family of 5 you'll need to watch out for them or get an occasional close call. That being said renting a motorbike in Nepal is quite an easy thing to do and also quite popular. The most popular place tourists rent bikes in Nepal is in Pokhara. Either to drive around the pristine lakeside area or to take that big road trip to Kathmandu. You can also take motorcycle lessons in Nepal quite cheaply. Though international standards may not be enforced or even known about. To rent a motorcycle in Nepal you should have a driving license. You should also take out insurance and a helmet from the place you are renting the bike. Ensure that you know how to maintain the bike and what to do in the even of a breakdown or flat tire. Motorcycle taxis in Nepal: These are usually inner city bikes that are not official forms of public transport. It's important that you are comfortable about being a passenger on a motorbike before riding on one. Between the traffic, zigzagging, bad roads and pollution it can be quite a hair raising experience! Renting a bicycle: Best kept to tourist locations like Lakeside in Pokhara, or around Sauraha in Chitwan where there's less traffic than in Kathmandu. Again you will need to be especially cautious of bad roads and hazardous traffic. But it can be a very enjoyable way of getting around in some areas. Motor Rickshaw: Once Nepal had plenty of motorized rickshaws. Today there are very few. High pollution and poor roads mean it's quite rare to see a rickshaw in Nepal. Cycle Rickshaws: Also once quite popular these rickety old carriages can still be found in many towns. Quite slow and awkward they are best used for short journeys or during bandas when you can still avail of them. It is possible to walk around many parts of Nepal's main cities. Tourist zones are in fact best seen on foot as there are often lots of interesting side streets and buildings.. There are however a few things to keep in mind when tackling Nepal by foot. There are very, very few street names. At least there are very few streets with signposts. Most people use landmarks to tell you directions which can be challenging. 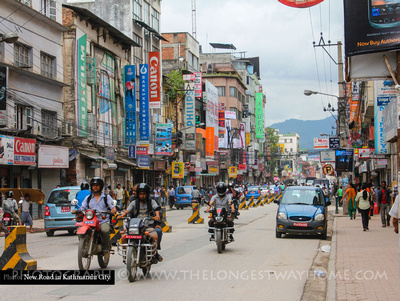 Nepal's streets are often very congested. Between motorbikes, taxies, the odd rickshaw, cow and a sea of humanity it can be quite a struggle if you are not used to it. Nepal's pedestrian pathways are also basically nonexistent. And those that do exist are often taken up with hawkers, beggars, waste or simply broken concrete. Nepal's streets are also influenced by the weather. They get flooded during monsoon season and can get very dusty during the summer. It's certainly very possible to walk around Kathmandu city or Pokhara and enjoy yourself. Just watch your step! Meanwhile out in the mountain side villages the lack of vehicles makes for some fantastic walking and trekking experiences. Renting a car in Nepal is possible but may not be worth the hassle. Between deposits, car insurance and the stressful driving conditions most people hire a car and a driver. This is either done via a travel agency or by simply hiring a taxi along with driver for select period. Many hotels can also arrange this for you. Shopping around for prices will help a lot. Download my guidebooks to Nepal! Liked this page? You'll love my books! My guidebooks are better than the rest. Yes, really! In them I cover all of the attractions with well researched information, photographs and travel tested walking tours. Getting around Nepal can be a challenge! Traffic in Kathmandu - motorbikes, buses, cars and the odd rickshaw!